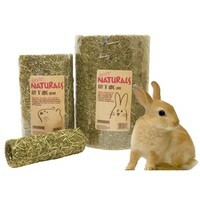 Boredom Breaker Naturals Hay 'N' Hide Gnaw Tube is an exciting toy, providing small animals with a secure hide-away as well as a robust surface on which to gnaw down their continually growing teeth. This extra-thick cellulose roll offers hours of mental stimulation for your pet as they can enjoy playing, hiding, nibbling and nesting in this versatile tube. My rabbits love to chew everything but had no interest in this. I got the small one. The tube is made of paper and glue. Yes, with a sprinkle of very low-quality grass on top, not even a layer, but a dusting,again, glued to the surface. I was absolutely pertfied when our pets gnawed the bit off the edge and revealed the cardboard base that resembles the toilet paper roll base at its best! There was no detailed ingredients list on the packaging that I went to fetch as soon as I saw the glue base, but there's nothing listed on the packaging, so we just need to hope our exotic pets don't drop dead after consuming cheap glued up recycled paper it's made of! It even smells like a loo roll. I bought the medium size for my guinea pigs and they enjoyed playing with it. It did however deteriorate rapidly as, being guinea pigs, they urinated inside it. I have found that its life can be extended by placing some newspaper inside on the bottom, and changing it daily.